Should I use caffeinated gels during long runs? How much caffeine is in Red Bull? We've all heard the warning: Coffee has a diuretic effect, is dehydrating, and doesn't count as a fluid replacer. While once deemed true, we now know differently. 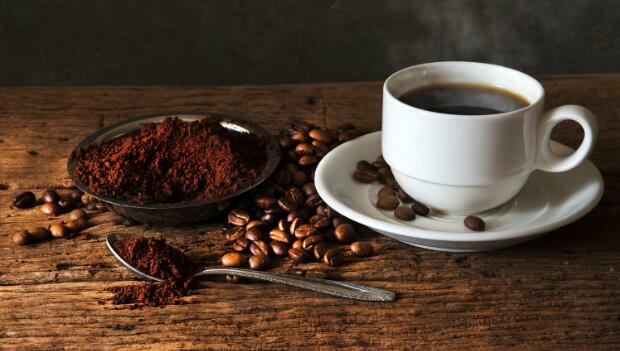 Given that about 80 percent of Americans drink coffee (55 percent daily, 25 percent occasionally), and the average intake is about 200 mg caffeine/day (3 mg/kg), most athletes are familiar with caffeine's benefits of heightened alertness and performance. Using subjects who habitually consumed a relatively low amount of caffeine -- equivalent to one, six-ounce cup of brewed coffee (100 mg/day; about 1.3 mg caffeine/kg), they found no detrimental effects of caffeine on 24-hour urine volume. (Armstrong, In't J Sports Nutr, June 2005) By day's end, the urine losses were similar whether the person consumed no caffeine or a high dose. How did the "coffee is dehydrating" myth start? The initial studies looked at urine collection just two to four hours after caffeine consumption (not the 24-hour picture), didn't compare coffee to water, or used very high doses of caffeine. We now know people have similar urine volume whether they consume caffeinated (<3 mg caffeine/kg) or plain water. A moderate caffeine intake is considered to be 250 mg/day. In research studies, the amount of caffeine that enhances performance ranges from 1.5 to 4 mg/lb body weight (3 to 9 mg/kg) taken one hour before exercise. For a 150 lb person, this comes to about 225 to 600 mg. More doesn't seem to be better. Most athletes get caffeine by drinking coffee; others consume caffeinated gels, chug Red Bull, or pop NoDoz pills. Because the amount of caffeine in coffee is so variable, some athletes prefer products with specified doses. If Starbucks or Dunkin' Donuts are your preferred sources for caffeine, be forewarned: Their specialty coffees are filled with calories. While black coffee has no calories, a "coffee regular" with two creamers and two sugars has 80 calories. A 16-ounce Starbucks Vanilla Frapuccino perks you up with 470 calories of sugar and fat; a Dunkin' Donuts Coffee Coolatta is 350 calories. These are not "diet beverages." Hopefully, they'll energize you enough to burn off those calories during a killer workout! Athletes vary in their response to caffeine; some are very sensitive and prefer to abstain rather than get over stimulated. Others thrive on a jumbo cup of brew. Clearly, you have to learn through trial and error the amount of caffeine that works best for your body -- if any at all. Perhaps more sleep could be the better energizer for some low-energy athletes. Sports dietitian Nancy Clark, M.S., R.D., counsels casual and competitive athletes at Healthworks, the premier fitness center in Chestnut Hill, MA (617-383-6100). Her best-selling Nancy Clark's Sports Nutrition Guidebook, Food Guide for Marathoners and Cyclist's Food Guide are available at www.nancyclarkrd.com.